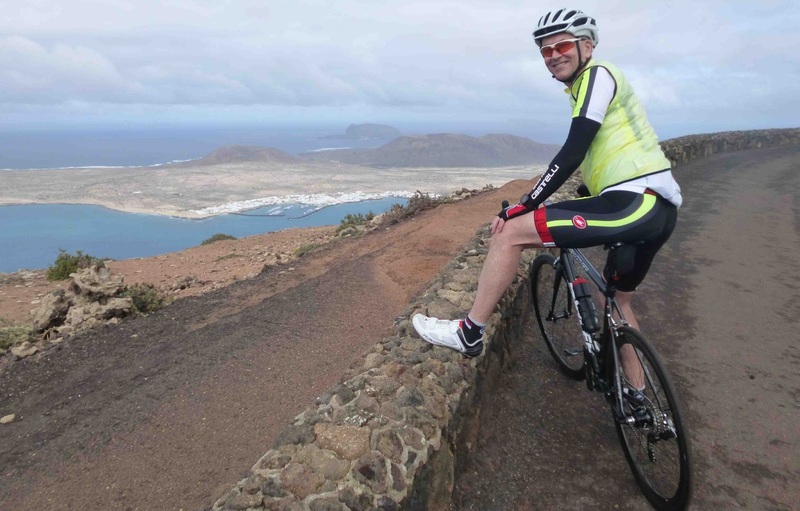 SimonWillis.net: So what's Club La Santa really like for cyclists? So what's Club La Santa really like for cyclists? For the last few years my wife and I have wondered what a winter week in this sports resort on the Canary Island of Lanzarote would be like. Would it be Pontins with push-ups? Hi-de-hi for the fit families of Europe? 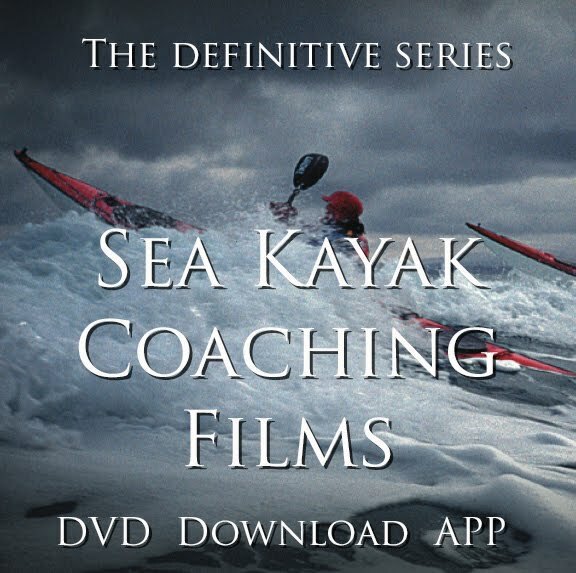 Or would it be a great way to train in relatively warm weather while home in Scotland turned grey, cold and soggy? We had a fantastic time and we will be going back. However, if you're considering a trip to Club La Santa it might be useful to know one or two things. While I have shown the text of my article to the marketing department at Club La Santa for accuracy, we paid full price and I'm receiving no form of kick-back for what I write. This is my opinion, it's not an advert. Club La Santa is all about multi-sport. I’ll not list them here (there wouldn't be space!) but your money buys you access to loads of different classes and facilities. For us, one of the main attractions was three 50m heated pools. Three - we only have four in the whole of Scotland! If, like us, you want to work on your swimming, attend yoga and other classes, and go cycling then there’s no place quite like it. It is no wonder triathletes love the place. If you only want base from which to ride your bike then that is a very different matter and arguably a waste of money, because all those extra facilities and classes are included in the price. What’s more, La Santa is out on its own, adding around 30km to every ride, which does not suit every training schedule (I was recovering from surgery and wanted to ride no more than 50 miles). A cheaper apartment could probably be found in a location better suited for those who only want to ride their bikes. Club la Santa run specialise cycling training camps which might suit some riders (there are swim, triathlon, golf... all sorts of camps). I've previously written about a cycle training camp in Spain which was nothing like I expected but where I picked up small yet useful nuggets of knowledge just from cycling with experienced riders. I expect the cycle camps here would deliver similar benefits, but bear in mind their cost is in addition to price of the stay, so my earlier comment about paying for unused facilities and classes still applies. On arrival we were presented with a densely packed six-page programme of the week’s classes. Some classes, like the Stretch and Relax (wonderful after a long ride) require no booking, but many of the good ones have limited place numbers and can be reserved two days in advance. Hesitate and they're lost. Popular classes, like Aerial Yoga, book-up exceptionally quickly so there's a waiting list system. If you secure a coveted place you must turn up at least 10 mins before the class starts, or your spot is handed to the next person on the waiting list. Sit down on the first evening and list every class you want to do, day by day. Highlight the ones which need to be booked and the day on which you must book them. Be at the booking office when it opens and reserve a place. If you skip the class, someone else will take it. We travelled at low season and secured places at almost all the classes we wanted, although on one occasion Liz was 21st place on a waiting list (she didn't get in). It didn't matter too much because the classes were just extras, supplemental to our main activities of cycling and swimming. I do wonder how easy it would be to book a class in high season when there are many more people in the resort. If classes are important to your stay I would seek reassurance about availability before booking high season. 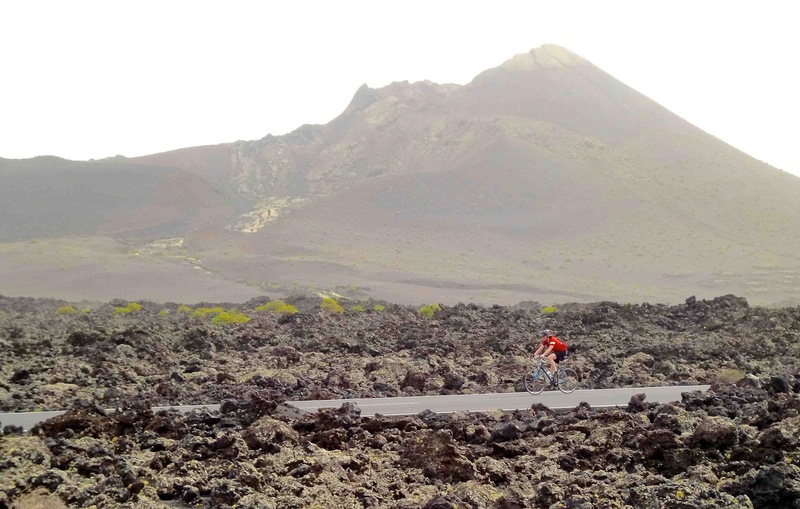 Wind is an almost constant feature of riding in Lanzarote. During our stay it was particularly strong (22mph) from the north. You can take the positive view that wind increases training effort but after a while I found it a real pain. Chatting to another cyclist who had been on the island for a fortnight we decided the riding was about 20% harder than at home - ie 40 miles felt more like 50. Roads are not as universally smooth as some magazine articles led me to believe and some smaller roads are real bone-shakers. There's a third category of puncture-inducing rough roads and even the maps don't agree about where these run. Riders tackling 100km plus each day might start to repeat roads within a week. There are roughly four sections to the island. The north is the high ground with steep cliffs lining the north west coast. A ride through Haria and out to Mirador del Rio takes you to the wild, windswept northern tip of the island (don't follow the road signs but take the minor road for superb views without paying to access the visitor centre). Whizz downhill to the cafe in the harbour beside the ferry in Orzola, then follow the north east coast road to Arieta and another bar. Either climb back to Haria and retrace the route or pick one of the many other ways back. The south west section of the island is the National Park. 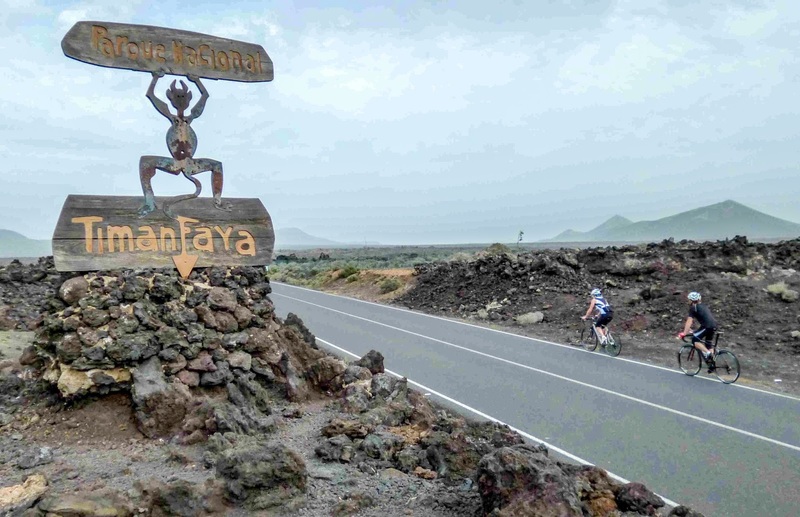 From Tinajo to Yaiza is an almost straight road through a volcanic building site - there were eruptions as recently as 1830. The land is black and brown and looks like it would rip you to shreds if you fell on it. Walking to take a photo I felt the pumice destroying my cleats. Into a headwind, this ride feels like it goes on for hours. Once at Yaiza, another cafe stop, several roads allow a loop back through Mancha Blanca to Tinajo. 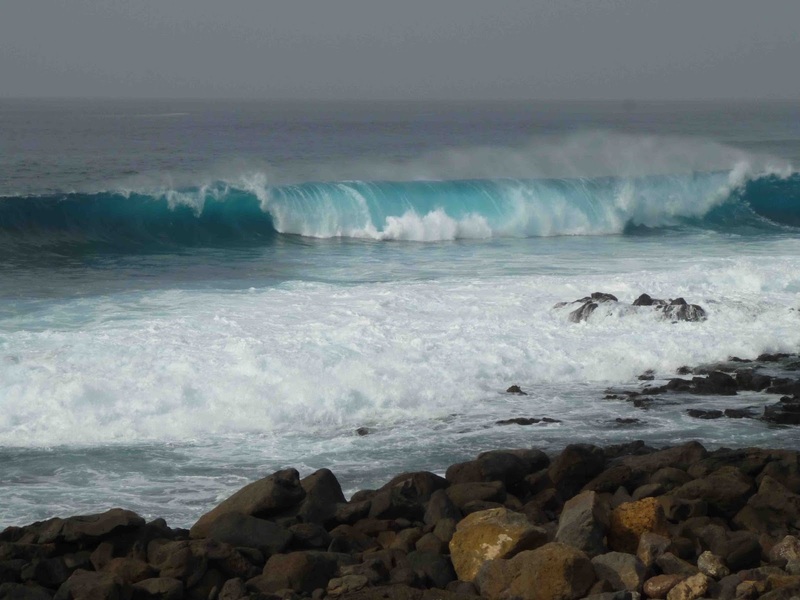 The south of the island, everything below Yaiza, is almost as challenging and almost spectacular as the north. The side loop down the coast from El Golfo is superb. In summer the coaches might make riding here a little tricky but in December they were fewer in number. Indeed almost all the drivers seemed courteous to cyclists, waiting behind until safe to overtake. There's a minor road alongside the main one down to Playa Blanca which looks like every other Spanish resort I've visited but with the attraction of great views across to the other Canary Islands. I wouldn't want to book an apartment down here for a cycling holiday - it felt out on a limb. The ride to Maciot climbs inexorably, then came one of the steepest climbs on the island, up zig zags to Femes. Yes, there is a very active Strava segment for this and no, I'm not KOM. I've left the south east of the island until last because I didn't ride it. Puerot del Carmen is the island's big resort town. Endure the inevitable tourist tat and there will probably be bargain accommodation to be found along with some good bike shops. Development is such that this town almost slides into the capital Arreciffe with only the airport between them. 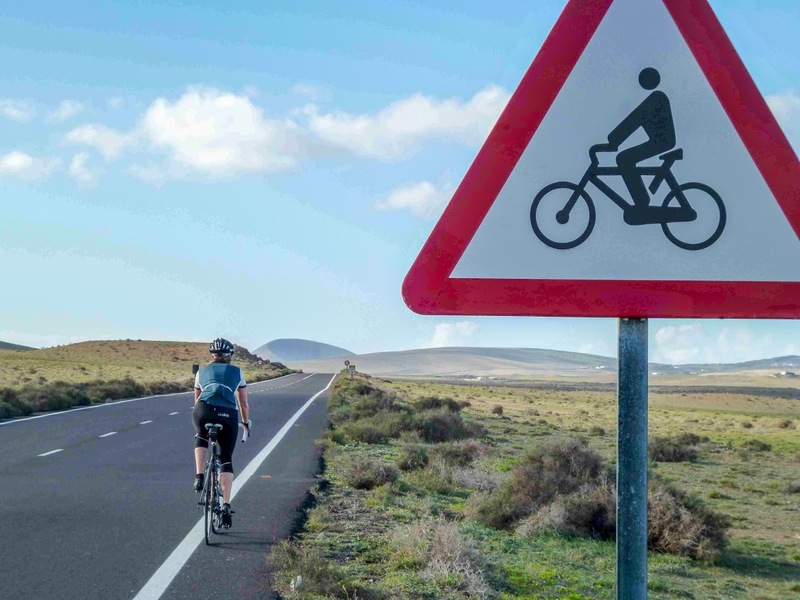 Costa Teguise further along would also make a decent cycling base. This part of the island gets less wind than Club La Santa and, I'm told by a local, is frequently five degrees warmer. This might make it attractive in winter, but those same factors make Club La Santa the place to be when the temperature rises. 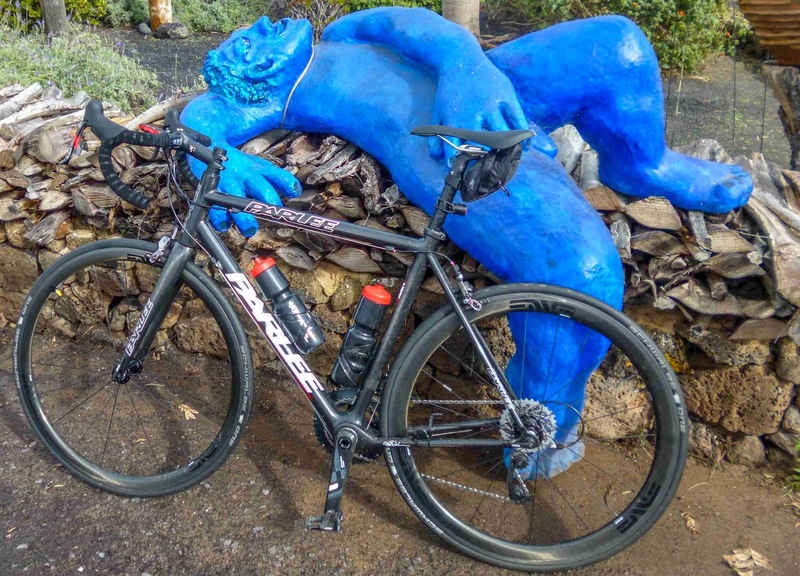 Although they are both keen cyclists, neither of our friends Allister and Jo had previously had a professional bike fitting, so they were intrigued to see the Guru Fit System being offered in Club la Santa's main square for just £45. Jo had been experiencing pains when riding so she booked a session. Allister later told me he was astonished to see his wife's output rise by a significant wattage when all the fitter had done was tweak her cleats and seating position. In fact he was so impressed he immediately booked a session for himself. I didn't see the Guru system in action but it sounds less comprehensive than the Retul fitting I had a few weeks earlier in Scotland, albeit a fraction of the cost. We booked one of the new, two bedroom apartments, sharing the cost with Allister and Jo, and felt it was good value. The new apartments are excellent. The slightly pricier "sea view" is not worth the cost because the sea is so far away and, when we visited, very rough. Each structure is one up, one down, except for the four bedded apartments which are duplex. We requested a quiet location and, even though we were close to a thoroughfare, evenings were quiet and peaceful. We were so exhausted we were often in bed by 9pm and slept soundly even with the window open. Inside the quality of the apartment was superb. Some people might expect a dishwasher or clothes washing machine but we didn't mind their absence, washing out our cycling kit in the sink. We heard no noise from upstairs (was anyone there?) and a ground floor apartment is definitely easier for wheeling bikes in and out at the end of the day. Bike locks are unnecessary. 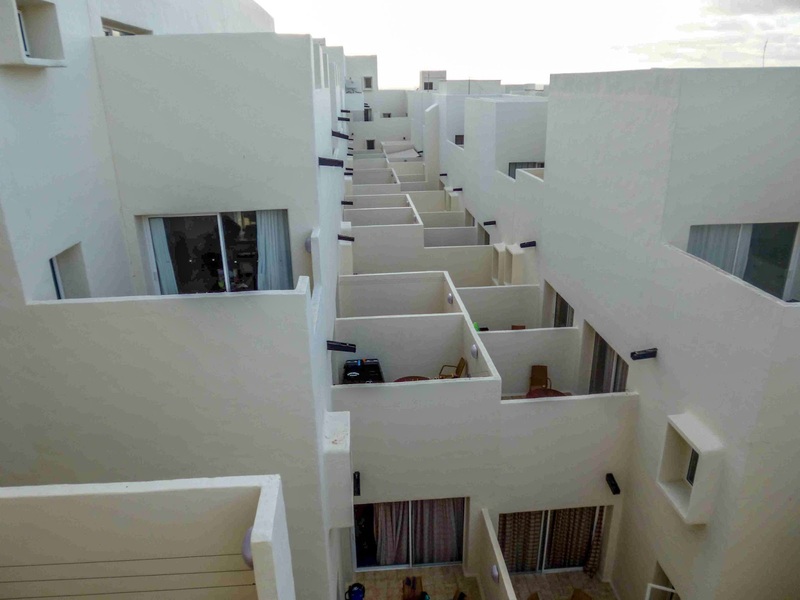 The new apartments are white and set a short distance away from the existing Club la Santa complex. During our stay we asked to see some of the apartments in this main area. The un-refurbished apartments are much cheaper but grim by comparison. 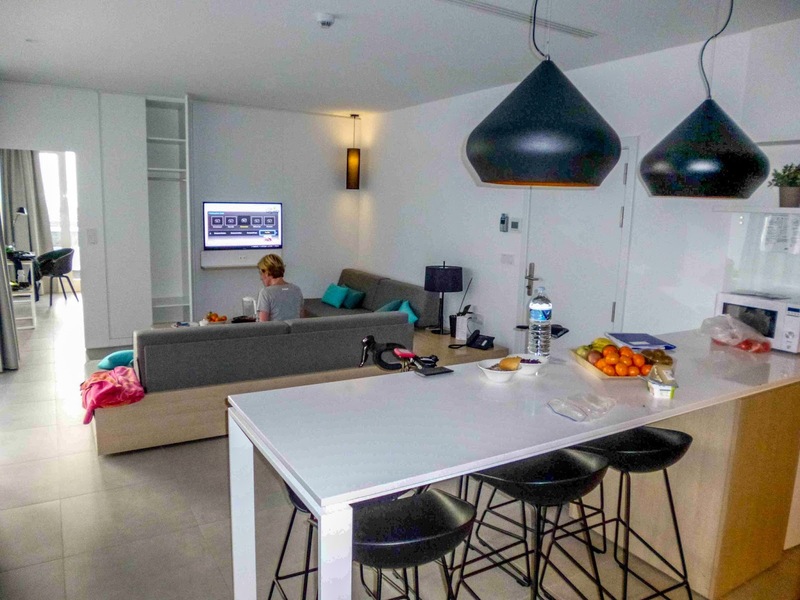 The refurbished apartments are of much higher quality and could be absolutely fine if you're only going to use them as a place to sleep and occasionally eat. However, the main risk of booking in the main complex is noise. Construction and refurbishment is underway, but because this stops each evening, that's not the concern. The noise which would give me pause is that from other guests. 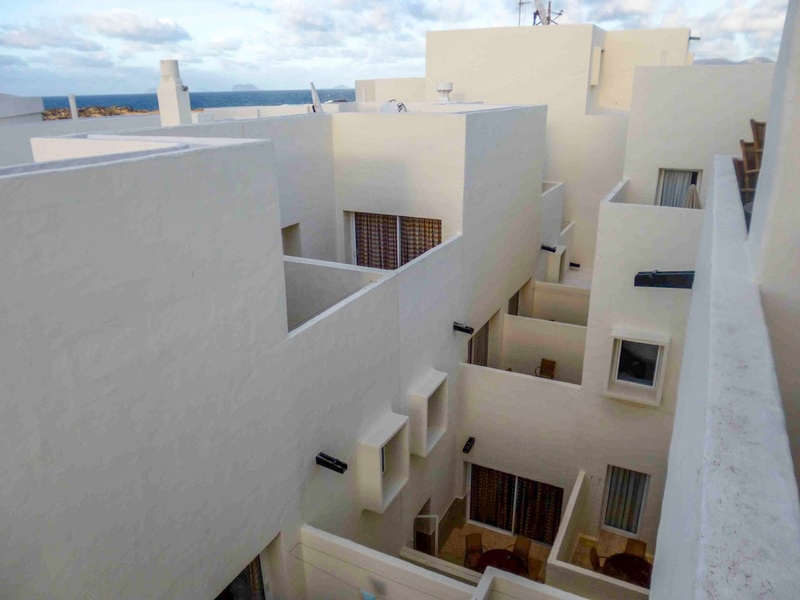 The main complex at Club la Santa is a concrete-and-tile network of apartments and corridors. For many guests I expect all will be well. But TripAdvisor tells of complaints from visitors who have been kept awake until the early hours by noisy kids and partying adults. Privately, I asked some staff and they confirmed noise can be an issue for some guests. I stress, we had no first hand experience of this whatsoever. It might happen very rarely and TripAdvisor only highlights the worst cases. After all, most people go to Club la Santa to train not party. But we saw several parties of what looked like school kids and young sports club groups and they did not look like they were about to go to bed at 10pm. Concern about a good night’s sleep would make us hesitate before booking an apartment in the main complex. We ate once at one of the three restaurants in the complex and found it slightly over priced for unexciting food. Other people I spoke to were delighted, so it's personal taste, but we didn't return. We catered our own breakfasts and ate light lunch wherever we were riding. On three nights we cooked our own dinners in the apartment and ate out on the other three nights in one of the many good restaurants nearby. In the village of La Santa, the restaurants Verde Mar and Amendoa were our favourites. Club La Santa has a small supermarket, slightly more expensive than some others but very handy and with good fresh bread. We did one big shop driving from the airport then resupplied at smaller supermarkets in La Santa and Tinajo. The cost of a taxi transfer made me splutter when I read the price – I won’t reproduce it because I’m still not sure whether it was a misprint. For £280 we rented a Peugeot Partner (like a Berlingo) into which fit 2 bike boxes, luggage and four people, so we shuttled across from the airport to Club La Santa in two trips. The rental car was essential to my holiday. Because I wanted to ride shorter distances on this trip, to help my recovery from surgery, the vehicle allowed me to start the loop at places other than Club La Santa. It was also extremely useful for heading to and from restaurants or collecting shopping. "No es normal" is a Spanish weather saying - it's always unusually hot / cold / wet / dry. Come to think of it, we say the same thing in Scotland. A few weeks before we arrived, Club La Santa had experienced two weeks of solid rain, which I'm told played havoc with all the outdoor classes. Our days in mid-December were warm enough to ride in shorts, but the wind was cool enough for me to occasionally need arm warmers. Days often started hazy only to clear around lunchtime before the haze would drift in again. It rained on several occasions, two or three of which were utterly drenching cloudbursts that turned smooth roads scarily slick and caused fog to roll into high ground. I spoke to some riders who were very glad to have carried lights after a blanket of fog completely obscured them from other traffic on the narrow road with precipitous drops from Haria to Teguise. It certainly wasn't the blue sky riding we hoped for, but it was a lot better than at home. 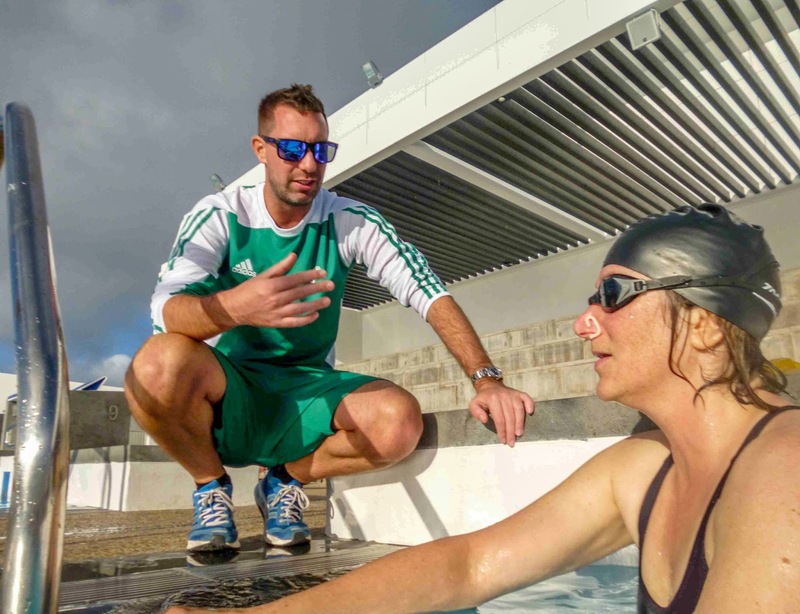 My wife is a keen swimmer and we booked video analysis to improve her stroke before leaving the UK. I’m less keen but tagged along. The cost is €150 each, which I considered rather expensive until I appreciated what was involved. 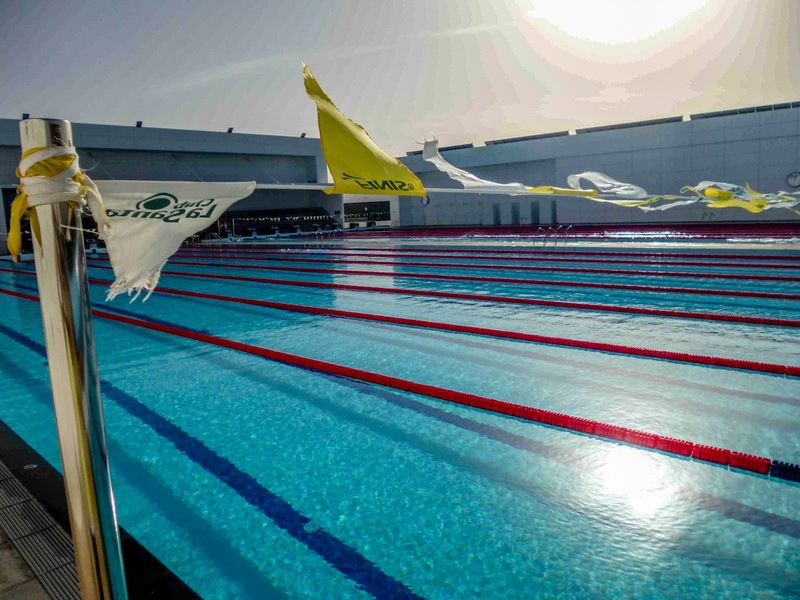 It completely transformed our swimming. The first session lasted two hours. The second session, two days later, lasted one hour. In this time we did the following; described how we thought we swam; were videoed underwater so we could see how we really swam; learnt how we should be swimming; finally we were shown drills to move us towards how we should be swimming. The sessions were taken by GB international swimming coach Paul Webb of FeelItCoaching.com and were a highlight of our stay. My wife an I will return to Club la Santa. Liz is keen to have more swimming lessons and to explore the other sports Club la Santa offers so she probably wouldn't take her bike. She would either use one of the free aluminium Canondale bikes available for guests to borrow and, if it's clunky, she'll rent a carbon bike on the days she wants to ride. We might choose a refurbished apartment in the older complex if the price is right, but we'd take ear plugs. If we can persuade friends to come and share the cost, we'd definitely prefer one of the new apartments. The very fact we discussed this on the plane home shows how much we liked the place. Hi Simon, many thanks for your frank review. Have you gone back since? We are about to depart to la Santa so any updated tips are welcome!